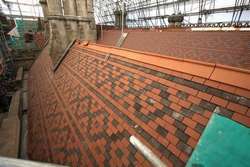 Re-roofing of Tyntesfield House, a Grade 1 Listed Victorian Gothic Revival mansion near Bristol, formed a major part of it's restoration. Leaks in the roof had caused water damage in most rooms and poor maintenance had contributed to its state. A key principal of the restoration was the retention, where possible, of all original materials and the use of traditional ‘like for like’ materials, which led to new Dreadnought roof tiles being used alongside those salvaged from the property. The sheer scale of the project necessitated main contractor CS Williams of Taunton, Somerset, to erect a massive 55m span free-standing temporary roof structure constructed of 28 miles of scaffolding tubes ­ the largest of its kind in Europe at that time. “Dreadnought offered what we considered to be the best colour match,” said Toby Pitt, of West Country Tiling, Frome, Somerset, which was responsible for the re-roofing. It sourced samples and put forward Dreadnought’s Staffordshire Blue and Red clay tiles for the project. “We are very pleased with them. Dreadnought produces excellent tiles and fulfilled every expectation we had of them,” added Mr Pitt. 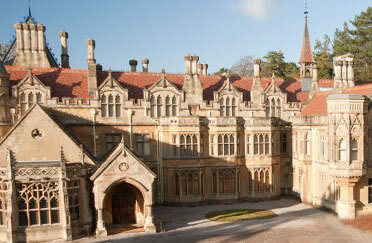 For even the most experienced craftsmen the roof work at Tyntesfield was challenging. 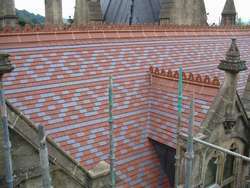 Dreadnought supplied 31,000 Red and 16,000 Staffordshire Blue smooth faced tiles for the project. As Dreadnought’s Staffordshire Blues were slightly lighter in colour than the originals they have been used on inner roof slopes and will darken naturally with age. Dreadnought also supplied tiles for repairs to the pitched chapel roof, which dwarfs the house in height. The £4.7 million restoration, co-funded by English Heritage and the Heritage Lottery Fund, was completed on time and to budget and has collected a number of awards, including the Chartered Institute of Building ‘Constructing Excellence South West’ and ‘South West Built Environment Heritage Awards 2011’. More recently it won the 2012 RICS ‘South West Building Conservation’ award and the RICS ‘South West Project of the Year’ award, going forward to the national final. It is also entered into the RIBA Awards 2012 and listed in the Directory of Conservation 2012. “The scale of the work that has taken place here is quite extraordinary and is probably one of the most significant moments in Tyntesfield’s history,” commented Tim Cambourne, Senior Building Surveyor, National Trust.